in this indicator set price number depend on Trend and Rang Base On Our RTS theory . this indicator show all support and resistance calculate on different times at a glance! ,free of depend any exclusive charts (Trends) like SLR Indicator ! This indicator show all support and resistance calculate on different times at a glance! , free of depend any exclusive charts (Trends) . Please keep in mind this indicator Designed on Chart event Calculated! And may be have little delay on live, if you want work on real markets! 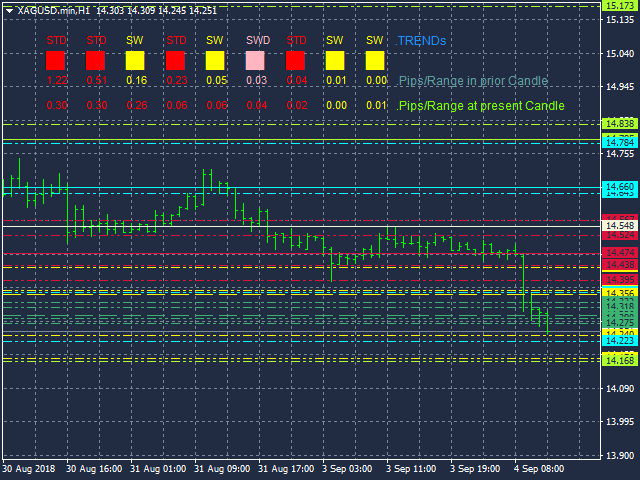 After a candle close, we have several support and resistance depend on High, Low, close and open on calculate so! RTS advantage! Show you all time at a glance in any chart free of exclusively a time chart s! In left upper corner chart all of this direction show with summarize word and separate colors.